Alphatec has extensive experience designing environmentally responsible facility types (<$1M-$44M) ranging from conventional administrative buildings to highly specialized prototype projects. Our Architectural team provides unique design solutions to suite clients' individual needs through strategic planning and programming. To be successful we must thoroughly understand our client's needs. Design begins with ideas, ideas flow to sketches, sketches precede analysis, and analysis dictates feasibility... but all that starts with an individual and their ability to think freely. People are the life-blood to any business and we make sure ours look forward to designing the future. With energy efficiency being a top priority, our HVAC team is equipped with the latest technologies and software tools to calculate building energy consumption and model whole-building simulations. Implementing energy reducing equipment and strategic control sequencing allows our team to optimize energy performance and effortlessly meet ASHRAE and EPAct requirements. Our electrical team looks beyond the attraction of the latest trend, focusing only on integrating technology's capabilities to pay off its transformational promise as clients and businesses look for more impactful approaches that are both pragmatic and affordable. Utilizing ASPE, IPC and other industry standards, our plumbing engineers are well versed in designing practical systems that conserve water and protect our environment and resources. By lessening the burden on waste-water systems and decreasing demand from municipal water supplier, our plumbing engineers are designing for future generations by increasing water efficiency. Life safety and fire protection are among the most critical design elements in a facility. Our fire protection team is dedicated to implementing the strict requirements of NFPA and local codes to ensure building and occupant safety for various building types and designing a fire protection system for the hazards each facility type is exposed to. Government buildings need to be efficient and designed around safety, security, and code compliance. Alphatec uses Autodesk 2017 Design Suite (Revit, AutoCAD, Navisworks) software technologies and support services to achieve the most from the minimum amount of materials considering function, aesthetics, cost, maintenance and flexibility at every stage of design. With the integration of BIM we have unlocked a tool in aiding with the critical allocation of resources, estimating, construction logistics, and scheduling to deliver a project on time and on budget. 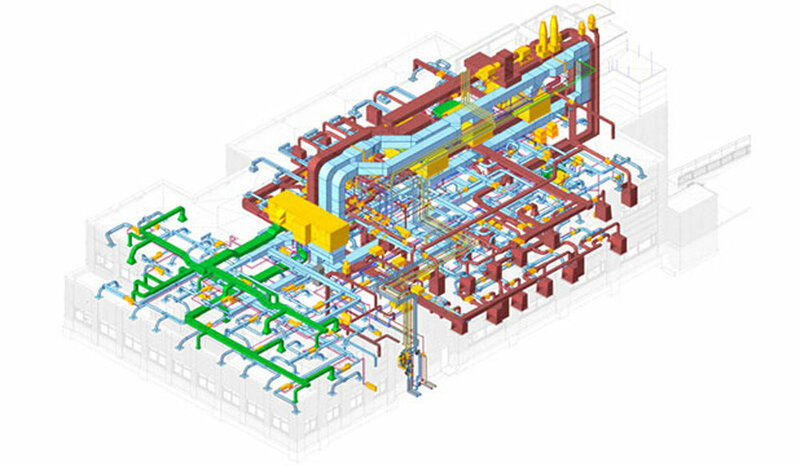 3D and 4D analysis, modeling, scheduling and energy simulations allow early visualizations and energy analysis to forecast built-building performance and provide a vehicle to transfer ideas and concepts between design teams and the contractor.